Australian Body Care Tea Tree Oil is one of the most exciting essential oils in the world. It is only extracted from the tree called Melaleuca alternifolia, which is indigenous to Australia and only grows in a relatively small area on the Northern Rivers region of N.S.W., Australia. 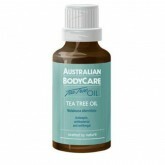 Australian Bodycare Tea Tree Oil is able to reduce irritation and inflammation so when applied direct to open wounds, insect bites, inflammation etc the irritation is immediately reduced. The fact that Tea Tree Oil does not sting or burn when used, but in fact relieves the pain makes this one of the most useful antiseptics for kids. Tea Tree Oil’s antiseptic properties disinfect and penetrate the skin deep down. The natural anti-bacterial properties of the oil help to keep the skin hygienically clean whilst maitaining the natural balance. Tea Tree Oil reduces bacteria and fungal problems and has anaesthetic qualities that provide immediate relief even after insect contact. Used daily as part of your skincare regime, this therapeutic gel hygienically cleanses blocked pores, removes dirt and excess oil and kills spot causing bacteria, whilst maintaining the natural balance of the skin. Non allergenic for sensitive skin. Ideal as an effective general antiseptic skin wash and a gentle shaving solution. After gently drying the skin use the palms of your hands in sweeping circular movements to massage this nourishing, cooling and calming lotion into the skin. 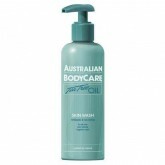 This beautiful formula will leave your skin silky smooth and supple and is so easily absorbed it needs no drying time.